We live in a world where information needs to be protected. When you need to protect your documents and important files and information, we offer a variety of various types of plastic security bags – secure document bags and pouches. 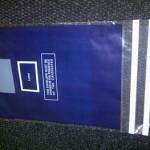 Contact us for more information on our plastic security bags.